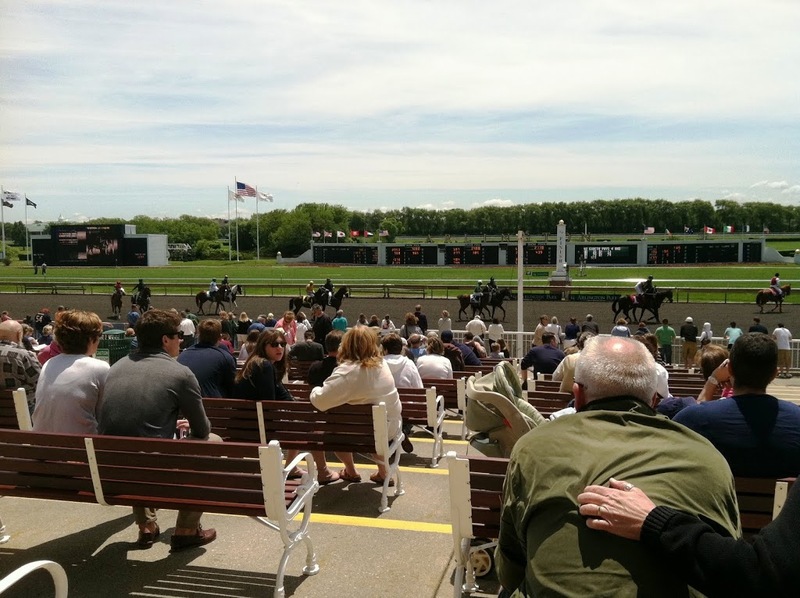 Sunday was a beautiful late spring day with temperatures in the low 70s and bright sunshine. Too nice to be inside! Georgia and I enjoy horse racing but we hadn’t been to the track for a long time. Sunday looked like it would be the perfect day for it. 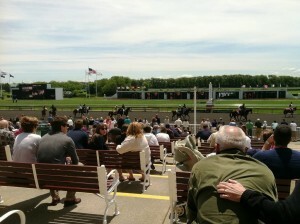 The first race at Arlington Park was scheduled for 1PM so we made the spur of the moment decision to go. We left home about 11 to get us there early enough to get lunch before the racing started. We parked in the clubhouse handicapped lot where, as I was unloading Georgia’s TravelScoot, a gentleman with one of those large mobility scooters came over with his family, to ask about hers. That happens to us a lot and we are always happy to tell people about it. One question he had asked was about the speed so Georgia zoomed off up the walk to the ticket windows leaving me and the enquirers far behind. That little scooter is quick! I caught up and bought our tickets plus a program then we went into the clubhouse and got lunch. We decided to take it outside with us so that we could stake out a bench at the finish line. Arlington has stadium seating in the clubhouse but there are no ramps in this area, only low steps. I helped Georgia walk down a couple rows to a good spot and then carried the scooter down and parked it behind our bench (here is a picture of what the seating looks like). As we ate we made our picks for the first race. As soon as the betting windows opened, I made our first bets. I wish I could report on all the winners we had but, there weren’t many. We started out with a win in race one but then only had two or three more over the next eight races. We hadn’t come expecting to win though so we only bet a little on each race, just enough to have horses to cheer on. It was a fun day for only a little money. Just before the fourth race, another couple asked if they could join us on our bench and we told them they could. It turned out we had both bet on the same horses so that got a conversation started and we enjoyed the rest of the afternoon together. They we visiting from Wisconsin and we were able to answer some of their questions about the area. It made the day even better to have some company. Despite using sunblock, we both ended up getting burned. We were probably just so pale after the winter that the sun got to us especially hard. But, that will pass. All in all it was a very nice day out for us. A good day out in the sun and watching the ponies run, sounds like a good time. I didn’t know you guys went to the track! I’d love to do that sometime. I’m a horse lover from way back. We haven’t been to the races, but I love to see the draft horses at the fair. 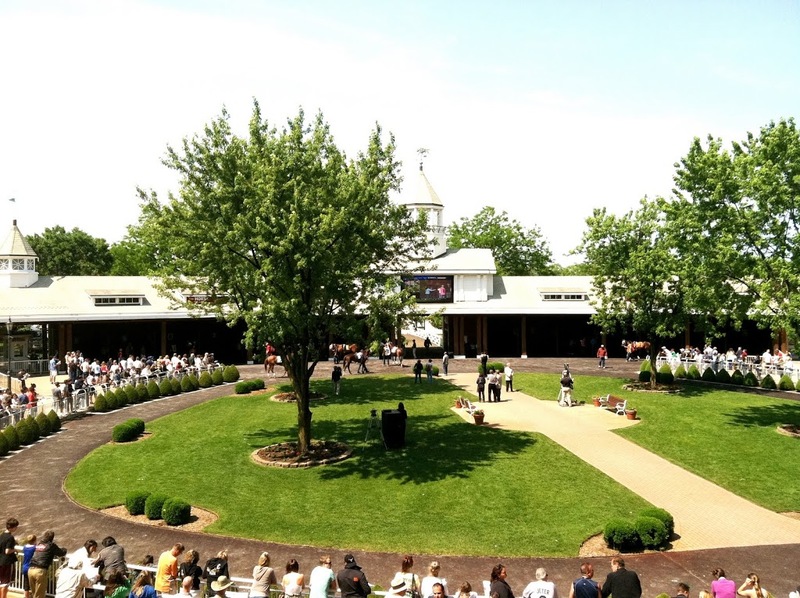 We took a trip over to St. Louis to see the Budweiser stables once – gorgeous farm, gorgeous horses.